Our Abpromise guarantee covers the use of ab53494 in the following tested applications. WB Use at an assay dependent dilution. Predicted molecular weight: 1 kDa. Competitive ELISA Use at an assay dependent dilution. (sensitivity: 0.01 ng/mL). Publishing research using ab53494? Please let us know so that we can cite the reference in this datasheet. 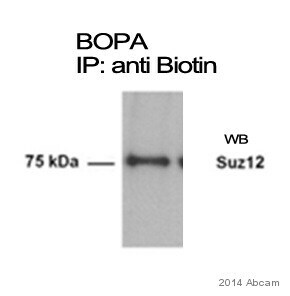 Inquiry: Hi, I am doing immunostaining and use your Anti-Biotin antibody (ab53494) antibody. But I would like to ask about what dilution range do you recommend with this antibody, because i want to use different dilution. i will be very glad if you inform me about this issue. The optimal dilutions or concentrations has to be determined by end user. We can recommend using the antibody at starting dilution 10ug/ml.